Excavations have shown that the present building occupies roughly the same site as the original cathedral, founded c.400 under the episcopacy of St Nicaise. That church was rebuilt during the Carolingian period and further extended in the 12th century. On July 6, 1210 the cathedral was damaged by fire and reconstruction started shortly after, beginning at the eastern end. Documentary records show the acquisition of land to the west of the site in 1218, suggesting the new cathedral was substantially larger than its predecessors, the lengthening of the nave presumably being an adaptation to afford room for the crowds that attended the coronations. In 1233 a long-running dispute between the cathedral chapter and the townsfolk (regarding issues of taxation and legal jurisdiction) boiled over into open revolt. Several clerics were killed or injured during the resulting violence and the entire cathedral chapter fled the city, leaving it under an interdict (effectively banning all public worship and sacraments). 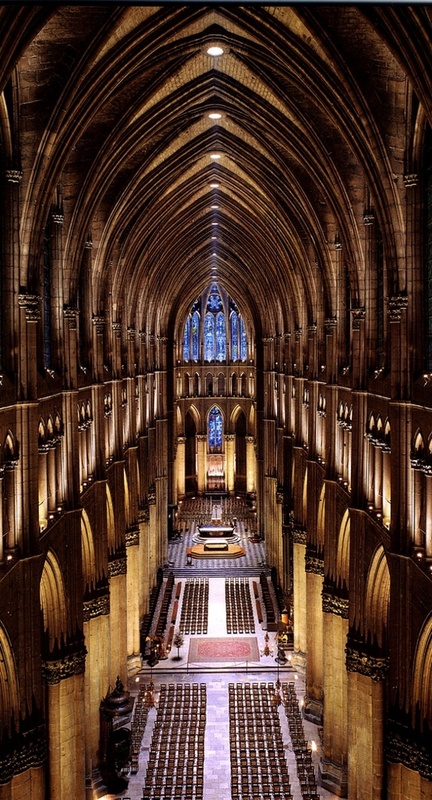 Work on the new cathedral was suspended for three years, only resuming in 1236 after the clergy returned to the city and the interdict was lifted following mediation by the King and the Pope. Construction then continued more slowly. The area from the crossing eastwards was in use by 1241 but the nave was not roofed until 1299 (when the French King lifted the tax on lead used for that purpose). Work on the west facade took place in several phases, which is reflected in the very different styles of some of the sculptures. The upper parts of the facade were completed in the 14th century, but apparently following 13th century designs, giving Reims an unusual unity of style. Unusually the names of the cathedral's original architects are known. A labyrinth built into floor of the nave at the time of construction or shortly after (similar to examples at Chartres and Amiens) included the names of four master masons (Jean d'Orbais, Jean-Le-Loup, Gaucher de Reims and Bernard de Soissons) and the number of years they worked there, though art historians still disagree over who was responsible for which parts of the building. The labyrinth itself was destroyed in 1779 but its details and inscriptions are known from 18th century drawings. The clear association here between a labyrinth and master masons adds weight to the argument that such patterns were an allusion to the emerging status of the architect (through their association with the mythical artificer Daedalus, who built the Labyrinth of King Minos). The cathedral also contains further evidence of the rising status of the architect in the tomb of Huges Liberger (d. 1268, architect of the now-destroyed Reims church of St-Nicaise). Not only is he given the honor of an engraved slab; he is shown holding a miniature model of his church (an honor formerly reserved for noble donors) and wearing the academic garb befitting an intellectual.